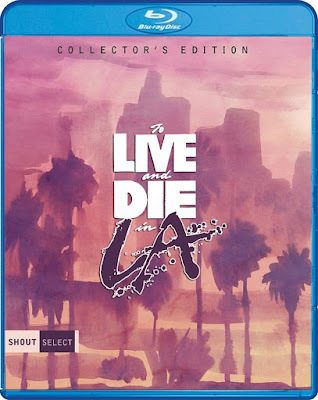 Rupert Pupkin Speaks: Shout Factory - TO LIVE AND DIE IN L.A. on Blu-ray ""
Within a few minutes of its opening, TO LIVE AND DIE IN L.A. immerses us in its 80sness. From Wang Chung's nostalgically antiquated theme song to hearing the voice of then president Ronald Reagan speaking on TV talking about taxation without representation, we are reminded when the film takes place. 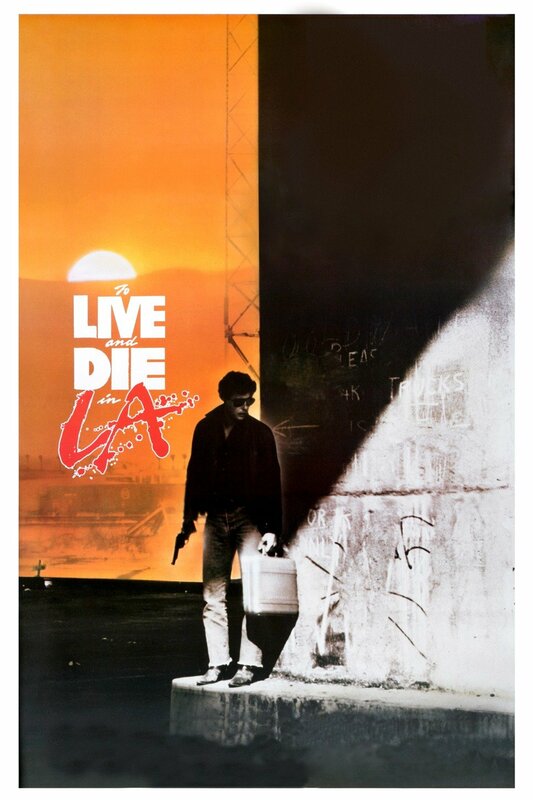 The Los Angeles we see depicted feels like so many urban centers in movies of this time - gritty and crime filled, with an undercurrent desperation. The film is also a holdout of studio filmmaking from a time when they still valued the cinematic greatness of a good car chase and amazing practical stunt work in favor of CG methods. It's been said many times, but the effect of practical versus CG can be felt in each crunching impact of one car into another as they feverishly and unstoppably rampage out of control through the streets. It of course became a cliche that action movies had car chases for a time, but you just don't see them done like Friedkin does it in this movie. From the man who brought us one of the greatest chase sequences in movie history with THE FRENCH CONNECTION, comes an attempt to top himself and though he doesn't quite do it, he still manages to make a grade-A top ten-er, maybe top five all-time. It's a breathtaking pursuit sequence in and around the L.A. river and it is unforgettable. Put it back to back with BULLITT, THE FRENCH CONNECTION and THE SEVEN-UPS and you've got some of the most harrowing stuff in all of movies. Friedkin really plants a flag in the sand and says, "Top This!" and I'm not sure anyone has since. The shootout in HEAT is the closest thing I can think of, but that's it. And Friedkin ups the stakes by adding an air of absolutely panic in the context of the narrative based on what has gone down right before the chase begins. It is the kind of thing that movies are made for. Immersive, relentless, edge-of-your-seat thrills that make you wonder how on earth they were filmed (after it's all over, when you can start breathing again). 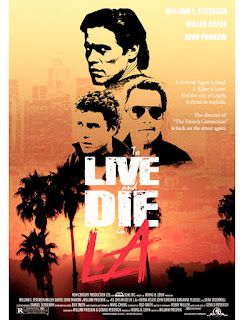 I remembered loving this movie, but it had honestly been so long since my last viewing that I had forgot all the things they make it so compelling.one of the things that blurs the movie a bit in my mind is the fact that William Petersen did this movie and MANHUNTER so close together. Both performances are truly some of my favorites of the 1980s. He just plays good cops. Petersen has this remarkable, raw, emotional almost-manic energy about him that helps him feel real in a way that many actors can't. When he speaks, it's like he's spitting the words from his mouth - as if from a machine gun. They come in bursts and in a way that doesn't feel like he's ever reciting pre-written dialogue. He can do ti from a place of anger, but also from a place of jovial, charismatic comradery - which is much less common. He's just so dynamic in that way and eminently watchable. Equally dynamic and watchable is Willem Dafoe. As the film's counterfeiter villain Rick Masters, he speaks slowly, creepily and deliberately. Dafoe has one of those faces that can play sympathetic when he wants to, but even more than that, he can play evil. His unsettling grin makes him almost look like The Grinch incarnate at times, but with no hint of potential redemption. Masters is as prone to arrogance about his craft as he is prone to homicide to protect said business. He has no scruples and no qualms about killing just about anyone if they are in the wrong place at the wrong time. To put it mildly, he's an excellent bad guy and an amazing foil for Petersen. Also fantastic is John Pankow as Petersen's cop partner. Here's a guy who I only really remember from his work on the popular 90s TV show MAD ABOUT YOU, so I was kinda blown away to see him play tortured, paranoid anxiety as well as he does here. Rounding out the cast is Dean Stockwell (who is never not good), a scummy John Turturro, action guy Steve James and the underrated Darlanne Fluegel as well as Robert Downey Sr. in a small part. 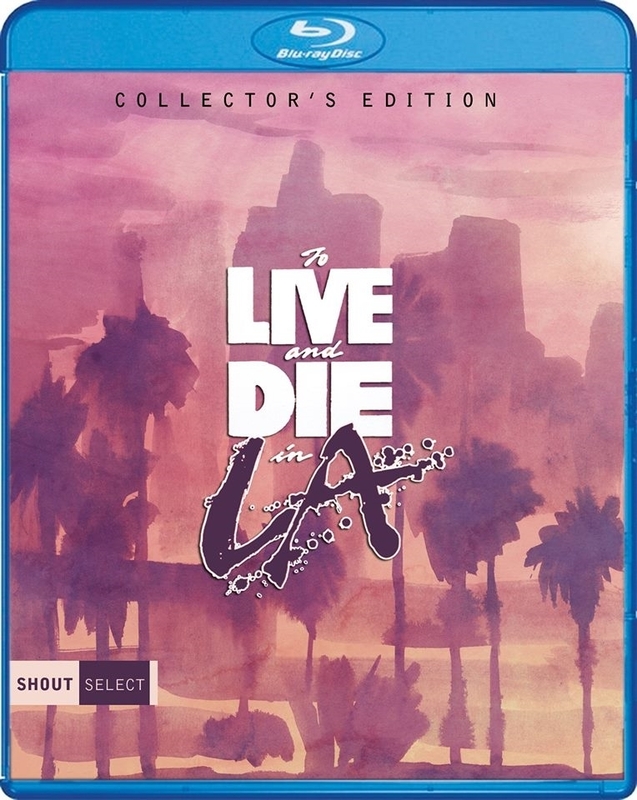 If you've never seen the movie or it's been a while since you've watched it, this Shout Select Collector's Edition (which looks good, but keeps the verite aesthetic of the filmmaking intact) is the perfect time to jump in. -Counterfeit World: The Making Of To Live And Die In L.A.